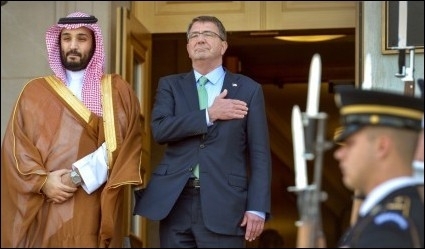 Saudi Arabia's Flawed "Vision 2030"
Deputy crown prince Muhammad bin Salman (left) is welcomed to the Pentagon by defense secretary Ash Carter, May 13, 2015. Salman's "Vision 2030" plan to revolutionize the Saudi economy is visionary but unsound. The plan fails to address the fact that the Saudi state rests on the three pillars of religion, tribalism, and oil. The dramatic drop in oil prices has depleted Saudi Arabia's cash reserves by a whopping US$150 billion and driven the ruling family to contrive hastily a financial rescue plan. On April 25, 2016, Deputy Crown Prince Muhammad bin Salman announced the "Vision 2030" plan to revolutionize the Saudi economy by ending its dependency on oil. Based on a report by the consulting firm McKinsey, the plan seeks to reinvigorate a Saudi economy that yielded an annual gross domestic product (GDP) growth of only 0.8 percent between 2003 and 2013, less than most emerging economies. The plan seeks to reduce the role of the public sector and bureaucracy while simultaneously empowering the private sector to become the main employer and vehicle for economic growth. The plan calls for the creation of a huge sovereign wealth fund to be funded by an unprecedented initial public offering (IPO) of a 5 percent stake in Aramco. The International Monetary Fund (IMF) reservedly endorsed the Saudi intention to address its alarming monetary deficit but voiced subtle doubts about Vision 2030, specifically because its 14-year time frame "sets a bold and far-reaching transformation of the economy to diversify growth, reduce dependence on oil, and increase the role of the private sector." Another more critical assessment by John Edwards, a member of the board of the Reserve Bank of Australia, warned that, in order for the plan to be successful, it must "profoundly change Saudi society and politics." And selling 5 percent of Aramco cannot reverse the kingdom's gloomy economic outlook unless revenues are generated as soon as possible from non-oil sources since the proceeds from the IPO equal the annual depletion rate of cash assets. Riyadh has already wasted precious time, having spent trillions of dollars in 1970-2014 on nine 5-year development plans that left 90 percent of the annual Saudi budget dependent on oil revenues. Vision 2030 is, therefore, bound to fail for four reasons: It is an overblown mega-project scheme; it focuses on economics and discards political development; it superficially approaches the challenge of instilling values of achievement; and it takes the generation of non-oil revenues as its ultimate goal. Saudi Arabia has established itself in the gold market and is now looking to expand into the copper, zinc, and phosphate markets. But mining does not require a large workforce and may not contribute much to the economic revitalization projected by the Vision 2030 plan. The McKinsey plan projects a $2 trillion investment program, which will double Riyadh's GDP over the next fourteen years. Yet, a sober economic analysis describes the ability to raise such a staggering amount of money as "practically next to impossible, unless crude oil prices see a significant appreciation, or Saudi Arabia plans to sell a higher portion of Aramco." Since the goal of Vision 2030 is to double GDP by increasing the industrial output of the private sector, investment in appropriate industries is a requirement. Vision 2030 focuses on creating jobs for Saudis to operate a modern, productivity-led economy. This raises the question of what industries to promote though "it is easier to say what kind of economy it won't be." Based on the McKinsey report, the plan identifies eight sectors that, if properly utilized, would generate at least 60 percent of Saudi economic growth. These include "mining and metals, petrochemicals, manufacturing, retail and wholesale trade, tourism and hospitality, healthcare, finance, and construction." The contribution of the private sector to the GDP would rise from 40 percent to 60 percent, thus lowering unemployment from 11 percent to 7.6 percent. This expansion of the Saudi economy is projected to enable it to move from its "current position as the 19th largest economy in the world into the top 15." However, serious issues impede the planned economic expansion. For example, Riyadh cannot realistically compete in labor-intensive manufacturing industries, as low wages do not appeal to Saudis accustomed to high-paying public sector jobs. The petrochemical sector is already well developed and has little room to absorb more workers. 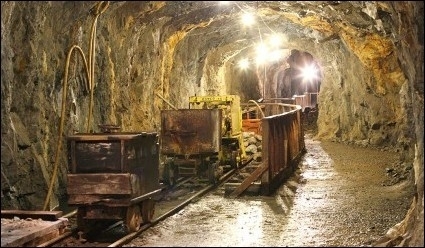 The same thing goes for mining, which also does not require a large workforce. Even if Saudi Arabia further develops its health care sector, it would be virtually impossible for it to become a medical hub because other facilities elsewhere in the region, such as in Lebanon and Jordan, are already far more advanced and readily accessible. Likewise, banking and finance require specialized training, and it is doubtful that the kingdom can carve a niche in this very competitive regional sector. The most promising economic sector remains religious tourism, which has grown in recent years to become the second most important economic activity after oil; in 2015, it netted $22.6 billion and is expected to add an additional $10 billion in revenues by 2021. Religious tourism does not actually need government investment because the Saudi private sector can readily handle it. But the main hurdle slowing the growth of religious tourism is the Saudi reluctance to issue visas. Privatization will increase dependence on foreign skilled labor because Saudis lack the skills and motivation to do manual or strenuous work. The proposed Saudi economic expansion necessitates building the infrastructure for a new industrial economy that will consume much of the proposed investment fund without assurances that it can generate sustainable revenues. Judging by the expansion of the Saudi development infrastructure over the past five decades, the need for expatriate personnel, including highly paid executives and skilled specialists, will increase exponentially. Privatization will also increase dependence on foreign skilled labor, despite the unattractiveness of the Saudi work environment, because Saudis lack the necessary skills and motivation to do manual or strenuous work. Another Vision 2030 goal is to place at least five national universities among the world's top two hundred and to empower Saudi students to exceed international averages in education indicators. But academic rankings are unnecessary: What the country needs is heavy investment in vocational education, which the vast majority of Saudis reject and consider beneath them. There is very little in Vision 2030 that previous Saudi development plans did not target. Building infrastructure, developing human resources, empowering the private sector to drive and diversify economic growth have been recurring themes from the second through the eighth 5-year development plans (1975-2009). In fact, Vision 2030 looks pretty much like a continuation of the ninth development plan (2010-15), with its emphasis on promoting sustainable development and raising the competence of the Saudi workforce while creating a knowledge economy in an environment of progressive structural development. Riyadh no longer has the luxury of ignoring the relationship between economic and political development. The transformation into a production state is bound to create a knowledge economy and break the kingdom's tribal-based system. Long gone are the days when Saudi Arabia could enjoy a holiday from politics as a result of "the lack of binding budgetary constraints,which reduced and sometimes even eliminated the need to set spending priorities and allocate scarce economic resources." 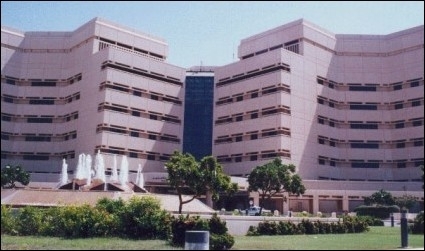 The King Abdulaziz University Hospital in Riyadh was the first teaching hospital established in Saudi Arabia. However, with only a 104-bed capacity, the hospital is representative of how far the kingdom must go to become a medical hub. Other facilities, such as those in Lebanon and Jordan, are far more advanced and readily accessible. But contrary to what one might expect from a country that claims to be committing itself to economic liberalization and ensuring the happiness of its people, the Saudi government is further clamping down on the freedom of expression—dismal to begin with—under the guise of promoting religious moderation. The Ministry of Religious Affairs has begun implementing an electronic system to centralize the Friday sermon throughout the kingdom's mosques; preachers will read a single approved sermon from an iPad. Yet, no matter what the government does to quiet demands for freedom of expression and participation, privatizing the economy and an influx of foreign investors and technicians, along with their families, are bound to "strain the conservative rules of Saudi society." Saudi Wahhabi religious doctrine is injurious to the cause of modernity. Deputy crown prince bin Salman's Vision 2030 plan is, indeed, visionary but inherently unsound. He wants to do away with the entrenched notion that "oil has become our constitution," yet glosses over the fact that King Abdulaziz ibn Saud's modern Saudi state rests on the three pillars of religion, tribalism, and oil. Wahhabi religious doctrine has become synonymous with radicalism and is admittedly injurious to the cause of modernity. Placing emphasis on the creation of a productivity-driven economy is bound to usher in a class society that would result in the withering of tribalism. In essence, the deputy crown prince is calling for deconstructing the pillars of the Saudi political system without replacing them with modern ones. The only thing political about Vision 2030 is Saudi foreign policy. The kingdom will forgo its traditional role of a swing oil producer instead opting for a major role in the global energy industry that requires the transformation of Aramco, its oil conglomerate, into "a fully-fledged international oil company." For Vision 2030 to succeed, all Saudi citizens must be able to "acquire the necessary skills to achieve their personal goals." This may be impossible in a society where family, tribal, and regional ties are strong determinates of identity and which has one of the lowest rates in the world of women in the workforce. Riyadh's cultural values do not support the objectives of Vision 2030. 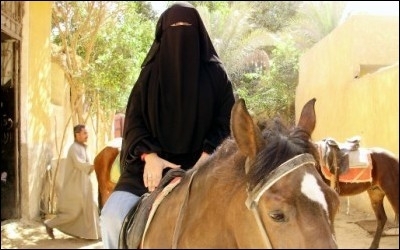 Saudi society is closed, status-oriented, and tribally structured. On the whole, Saudis are not law-abiding citizens, and they often violate it with impunity. They also tend to treat expatriates, especially laborers from poor countries, as nonentities unworthy of human dignity. Sordid abuse of hapless foreign workers is the norm rather than the exception. This makes it urgent to "rehabilitate the social environment to restrain shameful public behavior and total disrespect for the law." A population with universalistic values is essential to the operation of a modern economy, which will in turn force Riyadh to become a very different society, in short time, to implement Vision 2030. A Saudi columnist and radio broadcaster urged the government to introduce "new cultural and social programs to build citizenship and influence a more moderate and progressive society." Indeed, the plan does not neglect the need for building "a culture that rewards determination, provides opportunities for all, and helps everyone acquire the necessary skills to achieve their personal goals." By extension, this implies investing "in education and training so that our young men and women are equipped for the jobs of the future." But it is difficult and time-consuming "to rehabilitate and reeducate a population that has gotten used to a nanny state." The authors of Vision 2030 are keenly aware that for the plan to succeed, Saudi society must adopt the "values of moderation, tolerance, discipline, equity, and transparency." Yet it is absurd of them to claim that the authorities "shall have zero tolerance for all levels of corruption, whether administrative or financial." This is simply impossible in a society where family, tribal, and regional ties are stronger than the nebulous conception of state identity. This is probably why the plan avoids references to government measures to win the cooperation of the Saudi public that, in addition to its strong primordial ties, grew dependent on "state largesse that included fuel subsidies, loans, free land, and public sector jobs." Energetic and avant-garde Dubai presents a particular challenge to Riyadh's Vision 2030. The two neighbors belong to two different worlds and temperaments when it comes to business. Unlike Saudi Arabia, where most of its merchant community hails from Yemen's Hadramaut region, Dubai has a strong and well-established entrepreneurial spirit. Its indigenous population follows the Maliki school of thought in Sunni Islam that is considerably more moderate than the austere Wahhabi doctrine of the Saudi ruling elite. Whereas in Wahhabism the ruler controls society and enforces piety, the Maliki ruler does not implement compliance with the faith, which rests solely with the individual believers. As a corollary to its control of society, the Saudi state drives economic development. In Dubai, the emirate facilitates and lauds the achievements of its vibrant private sector. For Riyadh, the innovative edge of Dubai's rip-roaring capitalism is too tall an order to emulate. The International Monetary Fund urged the Saudi government to exercise firm control of public expenditures and to levy value-added and income taxes. The plan projects raising non-oil revenues from $45 billion in 2015 to $266 billion by 2030. It is questionable that Riyadh will find foreign investors to participate in its grandiose projects. Instead, it is more likely it will end up selling as much as 49 percent of Aramco's shares to cover the cost of its investment in Vision 2030. In its increasingly frantic efforts to avoid bankruptcy, the government's fixation is more on generating revenues than inducing economic development. Like other Gulf Cooperation Council (GCC) member states, the Saudi government is planning to introduce a 5 percent sales tax in January 2019, a measure bound to aggravate inflation. Riyadh also says it wants to withhold income tax that would be levied only from the expatriate workforce. In a poll of foreign companies operating in the GCC, 80 percent responded "they would consider moving abroad if an income tax were to be introduced." It is unlikely that Saudi Arabia would impose income tax on expatriates, but it is vigorously pursuing other means of extracting financial resources. The government is leaving no stone unturned as it identifies new sources of revenues. In recent months, for example, it introduced taxes on tobacco, carbonated drinks, air tickets, and travelers' arrivals and departures. Riyadh is already privatizing electricity and water supplies to cut public spending. The Saudi public must somehow be made to believe in the Vision 2030 plan and to commit itself to the government's financial austerity policies; otherwise, the plan will fail. But the plan took the public by surprise. The truth remains that the ruling elite has "embarked on a path of unprecedented transformation. A key characteristic of this major effort is that it is reactive." The most promising Saudi economic sector remains religious tourism. 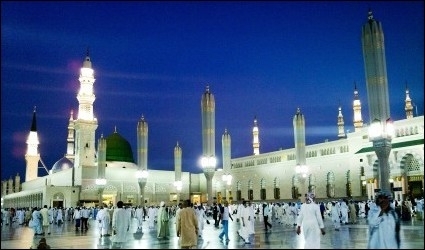 Saudi Arabia houses two of the holiest sites in Islam: The Great Mosque in Mecca and the Prophet's Mosque in Medina (above). But, the main hurdle slowing the growth of religious tourism is the Saudi reluctance to issue visas to pilgrims. Vision 2030 specifically focuses on involving the country's youth in the privatized market economy it hopes to found. This is particularly challenging since this age group (under the age of thirty) constitutes nineteen million out of a total population of twenty-nine million, forcing some two million Saudis to enter the workforce each year over the next decade. The Saudi economy is heavily skewed to the public sector, which employs about 70 percent of the indigenous workforce. Shifting gears toward privatization thus means ending the dominance of expatriates who account for more than 80 percent of the kingdom's workforce. But, there is no guarantee that privatization will lead to the generation of the desired jobs. And a production economy necessarily creates unwanted socioeconomic stratification. Saudi nationals have for many years taken for granted the availability of easy, high-paying jobs in the public sector and will not readily discard this comfortable reality. Without boosting direct foreign investment in genuine economic diversification, the Saudi sovereign wealth fund will seem as if it is taking from one hand to give to the other. This would transform the kingdom from an oil rentier state into an oil-financial rentier state. As such, Vision 2030 "resembles a 'phantasmagoria,' articulated by outside consultants insensitive to local cultures, structural constraints, and domestic power struggles and balances within the Kingdom." Prudent analysts seriously doubt the Saudi claim to end the country's economic dependence on oil by 2020. The only way for the Saudi economy to free itself from the hegemony of oil is to relinquish its role as a provider for society. The Saudi ruling elite is keen on avoiding the pitfall of Syrian president Bashar al-Assad who, at a time when dwindling financial resources could no longer support welfare services, employed authoritarian power to modernize authoritarianism. He impoverished his people, who were heavily dependent on meager welfare provisions, in the name of pursuing "economic liberalization and privatization, in the process of shifting public assets to crony capitalist 'networks of privilege,' expansion in the real estate, tourism, and banking sectors." This, in addition to other factors, resulted in a destructive civil war that has no end in sight. The Saudi leadership has traditionally shown remarkable resilience. The question is whether deputy crown prince Muhammad bin Salman, dubbed the prince of war and war, is truly capable of dissenting from the eternal policy charted by the kingdom's founding monarch Abdulaziz ibn Saud. Rakesh Upadhyay, "How Realistic Is Saudi Arabia's $2 Trillion Sovereign Wealth Fund?" Oil Price, Apr. 7, 2016. "Full text of Saudi Arabia's Vision 2030," Saudi Gazette (Riyadh), Apr. 26, 2016. Gassan al-Kibsi, et al., "Moving Saudi Arabia's economy beyond oil," McKinsey & Company, McKinsey Global Institute, New York, Dec. 2015. Arab News (Jeddah), May 26, 2016. John Edwards, "Vision 2030 (part 1): Saudi Arabia's Bold Reinvention Plan," The Interpreter, Lowy Institute for International Policy, Square NSW, Australia, May 19, 2016. "Can Saudi Vision 2030 save the Kingdom from a probable economic collapse?" Sasa Post (Mount Edgecombe, S. Africa), Apr. 26, 2016. Edwards, "Vision 2030 (part 1)." Upadhyay, "How Realistic Is Saudi Arabia's $2 Trillion Sovereign Wealth Fund?" John Edwards, "Vision 2030 (part 2): Saudi Arabia's Bold Reinvention Plan," The Interpreter, May 20, 2016. Kibsi, et al., "Moving Saudi Arabia's economy beyond oil." "Full text of Saudi Arabia's Vision 2030." Saudi Gazette, Mar. 24, 2016. Deutsche Welle Arabic (Bonn), June 5, 2016. Al-Arabiya News Channel (Dubai), Apr. 26, 2016. Vahan Zanoyan, "After the Oil Boom: The Holiday Ends in the Gulf," Foreign Affairs, Nov./Dec. 1995. Al-Qabas (Kuwait City), May 23, 2016. Arab News, Apr. 27, 2016. The Telegraph (London), May 18, 2016. Graham Peebles, "Killed Beaten Raped: Migrant Workers in Saudi Arabia," Countercurrents.org, Kerala, India, Dec. 8, 2013; BBC News (London), Sept. 1, 2015; Daniel Pipes, "Saudis Import Slaves to America," The New York Sun, June 16, 2005. Al-Arabiya News Channel, June 10, 2016. Samar Fatany, "A Promising Start for Saudi Vision 2030," Saudi Gazette, May 14, 2016. Al-Monitor (Washington, D.C.), May 2016. Adel Abdel Ghafer, "Saudi Arabia's McKinsey Reshuffle," Brookings Institution, Washington, D.C., May 11, 2016. "IMF Staff Completes 2016 Article IV Mission to Saudi Arabia," The International Monetary Fund, Washington, D.C., May 19, 2016. Forbes Middle East (Dubai), May 1, 2016. As-Safir (Beirut), May 20, 2016. The National (Abu Dhabi), June 6, 2016. Kamran Bokhari, "Saudi Arabia's Risky Reform Project," Geopolitical Futures (Austin, Tex. ), Apr. 26, 2016. "What Will Saudi Arabia's Vision 2030 mean for its citizens?" The Conversation (Boston), May 3, 2016. Madawi al-Rasheed, "Saudi king's cabinet reshuffle may 'rattle many royal spines,'" al-Monitor, May 10, 2016. See, for example, Business Insider International (New York), Apr. 26, 2016. Raymond Hinnebusch, "Syria: From 'Authoritarianism Upgrading' to Revolution?" International Affairs, Jan. 2012, p. 95. Related Topics: Oil & Gas, Saudi Arabia | Hilal Khashan | Winter 2017 MEQ receive the latest by email: subscribe to the free mef mailing list This text may be reposted or forwarded so long as it is presented as an integral whole with complete and accurate information provided about its author, date, place of publication, and original URL.